The nature of the DX-MIDI-Pro reflects why it's the big boys that dominate the mainstream electronic percussion market. The price is lower than that of many higher-profile entry-level kits and the pads don't feel too bad, but it's hard to put together, the sounds are average and the software isn't brilliantly conceived. It'll get you on the first rung of the electronic percussion ladder, but not much further. Affordable, less flimsy than looks might suggest. Uninspiring in many aspects of operation, sound and feel. Given the costs associated with the research and development of electronic percussion products, it's perhaps no surprise that corporations the size of Yamaha and Roland dominate the market. This situation isn't an obstacle as far as US company Pacific Digital is concerned, however. 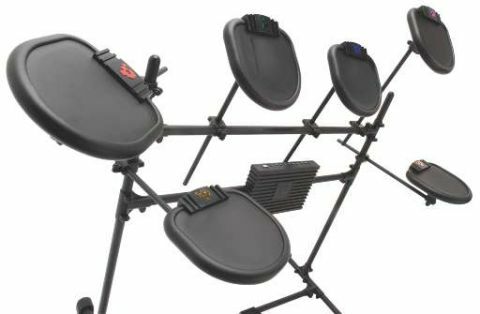 Primarily a manufacturer of consumer electronics (things like digital photo albums and media players) and digital signage, Pacific Digital came up with the DrumXtreme DX-MIDI-Pro electronic drum set reviewed here. The DX-MIDI-Pro kit comprises six rubber-surfaced pads (five single trigger and one dual trigger), a rack frame, foot pedals for kick drum/hi-hat duties, a DX MIDI sound module and a USB interface module. This latter element of the kit is a key part of its specification in that it allows the set-up to connect to a PC (not Mac) and work in conjunction with supplied software for tutorial purposes. Hooked up to a computer, the PC becomes the DX's sound module - the kit itself doesn't have any built-in sounds. If you want to use the kit in stand-alone fashion, then you need to employ the DX MIDI console, which is supplied as part of the MIDI-Pro set-up. The DX MIDI module is a familiar-looking unit, and functions as you'd expect. It'll take trigger inputs (on ¼" jack inputs) from any pad/source you care to use with it, contains 389 on-board sounds, 20 preset kits and 50 play along songs. It's a simple unit when compared to some of the offerings from the main players, but it's nowhere near as pricey. You'll notice from the pictures that the DX doesn't look quite as sophisticated as other electronic kits - both the square-ish pads and simple rack are pointers as to the set-up's modest price tag, as is the difficulty with which it goes together. The DX set-up's construction is basic and fiddly. When a kit arrives with a screwdriver and bags of nuts, bolts and plastic clamps you know you're in for a DIY challenge. The DX isn't terribly difficult to put together, to be honest, but it is a laborious process. It took us about an hour, partly because every single part - pads, rods, the USB interface - needs to have a clamp screwed to it before it can be connected to anything else, and any subsequent adjustment needs to be made with a screwdriver, which decreases the kit's user-friendliness. The rack comprises a collection of rather spindly-looking metal rods, and doesn't inspire confidence, but it proved less flimsy than feared. This is not a set-up you'd want to use on stage (it's not designed for that, to be fair), but it stood up to the physical assault of the review period reasonably well. But there's no escaping the fact that getting each pad into a comfortable position is a real challenge. Although beginners might be less fussy about where the pads are situated, the DX makes it hard to achieve an ergonomic and posture-friendly set-up. We should also mention the hi-hat controller and bass 'pedals' that come with the unit. To call them pedals is a misnomer - they're cheap-feeling plastic 'treadles', and basically a spring-loaded on/off switch mounted in a foot-operable housing. They trigger sounds well but there's no realistic or responsive feel. The pads and pedals link to the USB interface (the plastic box mounted on the lower rung) with mini-jack cables and the box sends signals to your PC via a USB socket. The interface doesn't need to be powered from mains, so there's one less lead to deal with, and getting pads and box connected is simple enough. We'll come on to what happens when the DX kit is co-joined with a PC shortly, but first we'll deal with its standalone operation with the DX console. The supplied connection leads are all mini-jack to mini-jack, which is fine for linking to the USB interface, but the module only has ¼" input jacks. So you need to use mini-jack to ¼" adaptors on every lead that plugs into the sound module - not exactly a sophisticated arrangement. The brain is fairly simple in terms of functions and sound quality, and the acoustic sounds are dated, exacerbated by fairly metallic reverb settings with which to treat the dry sounds. The electronic sounds fare better, as you may expect, although they are far from cutting-edge. The software shipped with the DX kit makes the host PC the sound source for the kit once it's hooked up with the USB interface. Again, it's a case of being average but usable rather than stunning. The software allows you to assign sounds to the pads and tweak their sensitivity, but there's nothing in the way of deep editing. The DX is best suited to beginners, so that's not to be criticised, but the sound of the kit is pretty much set as it is 'out of the box'. The software also features a game, to help co-ordination and skills. It's like Tetris, with 'crystals' relating to the pads and pedals falling onto a beating line - you hit the corresponding pad/pedal.